The holiday season is quickly approaching and it's time to share a new Christmas Gift Guide with you once again. This year, I have decided to focus on gifts that you and your children can enjoy while hiking and snowshoeing this winter. 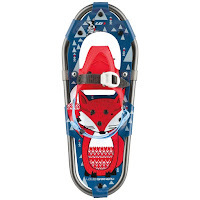 For pure cuteness, the new Louis Garneau Felix II Snowshoes for kids have my vote for this year's Christmas list. They have cute animal critters on them and can carry a child weighing 30-80 pounds so you won't be buying a new pair each year. Unfortunately I don't have much experience with men's snowshoes since my husband prefers skiing, but I was just at Campers Village and they have a huge selection of men's snowshoes to choose from. You can also find a great variety at other outdoor stores across Alberta. Snowshoes take you to places like this. My son has been wearing his Ducksday rainsuit for many of our winter adventures over the last year and it's my favourite piece of outdoor clothing for children. It keeps him warm and dry when worn over proper layers, it keeps snow away from the skin since there's no pant/jacket gap, and he has great freedom to roll around in the snow without having to wear bulky outer layers. Ducksday Rain and Ski Suits are Awesome for Winter Adventures! Ducksday Products for the winter win! My son is growing out of his rainsuit which maxes out at size110-116 (4-5y.) We've done well though because the sizing is generous and he's still able to wear the rain suit despite being a very tall 6 year old. To WIN a Ducksday Rain or Snow Suit (or product of your choice) come back to my blog tomorrow on November 19th to find out the details on a giant Outdoor Bloggers Instagram Contest, #ThankfulforFamilies. If you aren't on Instagram yet, you'll want to create an account for this contest which is going to be BIG! To order Ducksday products, visit the Ollie and Stella Outfitters website. And don't worry if you visit the online store and realize that you must be from the US. The company definitely ships to Canada!! Email the company directly to purchase your order at ollieandstellaoutfitters@gmail.com. The mittz have also been a god send for our family and my son never gets snow inside his gloves thanks to their design. They fit over top of the child's jacket and cinch tightly at the wrists and elbows to ensure snow stays out where it belongs! Both the bootz and mittz are waterproof and we've had wonderful winter adventures with Stonz Wear on our team. To order Stonz Wear Products for your family, visit the Stonz Wear website where you'll get free shipping on orders of $70+ across Canada and the US. Now that the kids are warm, Mom and Dad need to be suitably clothed as well! Enter KEEN Footwear with a great collection of winter boots for the whole family. And, Keen Canada has generously partnered with me as a sponsor for this year's gift guide!They would like to give one family a pair of boots or shoes to help with your winter adventures this year. Full contest details are at the bottom of this gift guide. From my end, I have just ordered a pair of the Revel III Women's Winter Boots and I tested them out on a short hike yesterday. My feet were toasty warm and I can see these boots going great places this winter. I will also be testing out the Bern Baby Wide Calf Boots on my city outings this winter. Full reviews and photos to come soon. To order KEEN boots for your family, visit the KEEN Canada website. Free shipping and returns is included on all orders within Canada. This is where my KEEN boots will go this winter! Mom's likely the one that's walking the kids to school in the morning, standing around the playground after school as the temperatures drop in the late afternoon, and the one who's taking the younger children outside to play during the day. Mom needs a warm but stylish jacket! Fortunately, I've found the perfect jacket that blends warmth and style, AND that I'll be able to wear on my winter hikes or snowshoe adventures. I've worn the all-new Barlow Pass 550 TurboDown Jacket hiking, snowshoeing and skating so far this month and have been toasty the whole time. I wear it to school in the morning and it keeps my bum nice and warm without having to wear a longer parka. I suspect this will become my new go-to jacket for the 2015-16 winter season and I have nothing but praise for the new jacket. The jacket has a 550-fill TurboDown insulation and features an Omni-Heat reflective lining should there be any doubt that you'll be warm. To see Columbia's full product line up, visit the Columbia website and go to the store locator to find an outlet near you selling Columbia clothing and gear. Winter is meant to be embraced and loved! We love winter hiking in canyons but there's no way I'd take my family on a slippery icy trail without some form of traction.Winter boots are great but they don't provide enough grip to prevent a potentially dangerous fall, and snowshoes feel cumbersome on ice. Thankfully, we've discovered the amazing Kahtoola micro spikes and the company makes an XS size for children who also need some sort of traction on slippery terrain. Thanks to my micro spikes, I can walk up frozen waterfalls, I can do winter scrambles on trails that are steep and treacherous, and I can enjoy winter to its fullest! This winter my son will also get his first pair of spikes (XS spikes fit a size 1-3 boot) and I can't wait to see how much more confident he becomes when walking on ice. Campers Village also agrees that micro spikes are a great tool for getting families outside this winter and they have partnered with me as a sponsor for this gift guide. They would like to give one family a pair of Kahtoola Micro Spikes in the size of their choice. Hopefully you'll like them so much, you'll wrap up a pair for each member of your family under the tree this Christmas. Full contest information can be found at the bottom of this gift guide. Kahtoola Micro Spikes get you to amazing places! What is a Buff? Only the best invention ever designed for winter and safer than a traditional scarf for keeping your face warm. Scarves can get caught in chair lifts, on playground equipment, or on trees while hiking. Meanwhile, a Buff is a tubular piece of fabric that can be worn as a headband, a hat, a balaclava, a neck warmer, or a scarf. They come in various fabrics (including fleece) and are often just as warm as a tuque or knit hat when warn over the ears. Every member of my family has at least one or two Buffs and we especially like to wear them under helmets. I also like to wear mine as a head band when camping to keep my crazy hair under control and my husband finds his to be a light weight alternative to tuques and hats. To read more about this amazing product, visit the Buff Canada website. Now that you're fully clothed and protected, it's time to focus on having FUN in the snow. And this is where the Strider balance bike comes in. Most families with toddlers or preschoolers will know about this 12" starter bike designed for kids aged 18 months to 5 years old. If you truly haven't heard of this pre-bike that's ridden without pedals, visit the Strider Canada website to take a look around. While most children will outgrow their Strider bike well before they turn 5, my son still loves his little balance bike! He has definitely progressed to a regular bike but he still uses his Strider bike in winter because of the ski attachment we got to go with it. Run Bikes YYC has graciously agreed to be one of my many sponsors for this gift guide and they would like to give one lucky family both a Strider Sport Balance Bike AND ski attachment to go with it. Full contest information can be found at the end of this gift guide. and to grab a pair of skis for your child's Strider bike. It just might be the best present under the tree this Christmas. Continuing with the theme of having fun in the snow, I recently discovered this cool little book by Melissa Dymock that's full of games you can play as a family while out hiking and exploring this winter. 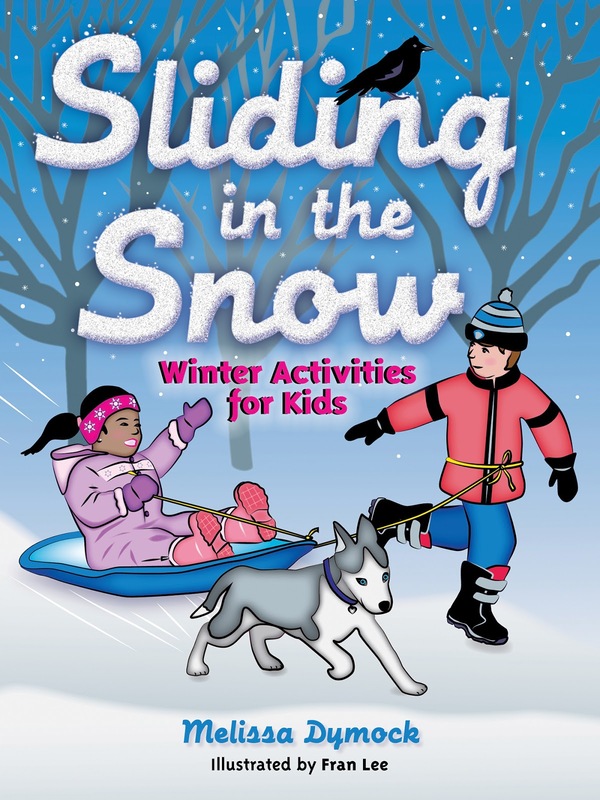 The book is written with colorful photos the kids will enjoy and covers everything from safety in the snow to winter-themed science lessons, history lessons on the origins behind popular winter sports, and even includes some winter recipes at the end. I've had a chance to preview the book and I'm very excited to try out a few of the games and activities this winter. I also know that my son will enjoy trying some of the science lessons and will like reading up on how some of his favourite sports became popular. I've talked with the author and she would like to give away a copy of her book to one lucky family. The book can be purchased from Amazon.ca and Amazon.com and would make a great Christmas present for children this year. Sleds are fun for all ages! Whether you choose to bring a Strider bike with Skis, a sled, or a snow scooter, bring something and the kids will have a lot more fun hiking this winter. Please read all conditions carefully before entering the draws. All contests close on November 27th. KEEN Canada: Enter to win one free pair of shoes from KEEN Canada. This contest is open to all Canadian Residents. The "free shoe" card will be mailed to the winner and you will order your pair of shoes from the KEEN Canada website with free shipping. Kahtoola Microspikes from Campers Village: Enter to win one free pair of Kahtoola micro spikes in the size of your choice. The contest is open to all Alberta residents and you must be able to visit a Campers Village store in person to pick up your prize. The micro spikes must be picked up before Christmas or the winner will forfeit their prize. Stores are located in Edmonton and Calgary. A Buff from Kananaskis Outfitters: Enter to win a buff of your choice from Kananaskis Outfitters, located at Kananaskis Village in Alberta. The contest is open to all local residents near Calgary and you must be able to visit the Kananaskis Outfitters Store in person to choose and claim your prize. The Buff must be picked up before Christmas or the winner will forfeit their prize. Strider Sport Balance Bike from Run Bikes YYC: Enter to win a Strider Sport Balance bike with ski attachment from Run Bikes YYC. The contest is open to all Canadian residents. Free shipping will be provided for Alberta residents only. 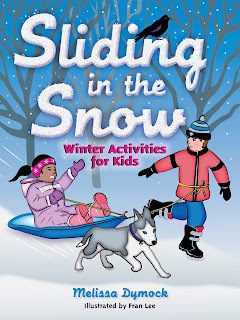 "Sliding in the Snow" by Melissa Dymock: Enter to win a copy of the book "Sliding in the Snow." The contest is open to all residents of Canada and the US. Free shipping is included. We love to make our own trail through the woods and investigate tracks, trees, and sliding hills that we find along the way. I love just watching my kids frolicking and enjoying the snow!! Baby Bern wide calf would be great! Choosing just one pair of shoes from keen is hard! I really like the look of the hoodoo III though! Thanks for some great suggestions and some pretty sweet contest prizes! I love my buffs! I have winter and summer ones. They work great at keeping my hair out of my face on windy mountain tops because I find hats blow off. In winter I wear a fleece buff instead of a toque. They keep my ears warm on chilly mornings when hiking. boots boots boots! i need new hiking boots! Love Strider bikes for the littles! I have never been snowshoeing but would love to try it. I'm really longing to play in the snow with my kiddos s this winter! My micro spikes would get me out on icy pathways! a pair of hiking boots would be a great gift for my sister - I would most definitely gift her the card to pick up a pair so she can enjoy the rockies this winter. Would buy new boots from keen. Never wore a buff head wrap, my two year old would love the strider ski for anywhere I take her. Would love spikes to keep me upright on the trails. Thanks. I would buy a new pair of hiking boots. Thanks! I would love the KEEN Winthrop II WP boots! SO cute! I would use Kahtoola microspikes for winter and shoulder season hiking in Alberta! Buffs are good for keeping drafts going down your jacket! I don't like stuff tight around my neck, so it works great for me! I like them for the kids too - safer than scarves that can dangle and get stuck on stuff. Our favorite winter family activity is skiing (alpine and nordic)!! Both girls have really taken to it, but we love snowshoeing and skating too! Tania, I hope you realise how inspirational and instructional your blog has been! Yesterday was 39 degrees in South Australia, in less than ten days our year's adventure in Canada will begin. Thanks for writing such a great list of things for us to get when we arrive, we can't wait to get outside in the snow! We're entering for most things, but the Strider bike and ski looks awesome. On the wish list rather than the essential, but so much fun! I hope it's not cheating if I leave one comment answering all the questions. 1. Keen boots - i would love a pair of warm, but stylish boots for wearing around the city. We just got my 1.5 year old daughter a pair of keen boots for winter and I am jealous of how stylish and cute they are. 2. Miro spikes - I'd actually wrap them up and give them to my Mom for Christmas, then she'll stop borrowing my husbands each time we hike in winter together. 3. We love Buffs - we use them for the same things you put in your blog. I also keep a spare one for all of us in the diaper bag in case it's colder out in fall/spring that I anticipated. 4. Our favorite thing to do in snow as a family is snowshoe. Thanks for another great Christmas guide! Bailey Dexter I really like the KOVEN WP and fell in love with the WINTHROP II WP these are also a great for winter! Bailey Dexter I know we would love to take my grandson on the local trail here he would have so much fun with the Strider Ski Bike!!! Would love to also get my hands on some Revel III Women's Winter Boots! Would love some Keen shoes for winter jogging. My son confiscated my buff the other day...he said he was a ninja and I haven't seen it since! I need it for bike riding and outdoorsy emergencies! Also good for keeping my head warm when camping. The same ninja needs microspikes for when we go clambering up icy creeks in winter. Happy November, everybody! Great suggestions! Thanks. Keen - I would LOVE a pair of Keen of Scots boots - what a great name!!! The microspikes would be awesome to use for wintery walks in this land of chinooks where things heat up and then freeze again! I don't have a Buff wrap - but everyone raves about them and I would love to find out all the ways I could use one! And, my favourite winter activity will always be skiing!!!! We like to play in the snow, have snow fights and sledding. I'll answer everything at once. I'd love a pair of Keen Elsa boots. While my hubby and I both have Kahtoola spikes, I'd like to give my mom a pair to keep her safe on walks! I have a wool Buff wrap but I'd love to get one for hubby for Christmas. We plan on lots of local snowy walks this winter with the toddler and new baby! I would definitely buy a pair of hiking shoes of myself from Keens. I would use the microspikes to do some exploring in Banff. I've never used a Buff head wrap before- they sounds interesting! I would take the strider bike with skis to school each day with us. I need a great pair of WINTHROP II WP's. Living in Edmonton, and going to the mountains..means good boots are a must. Keen boots for me for wintery days in the city. Micro spikes for my daughter for slippery hikes and walks. We all love our buffs... Esp for winter activities (and for covering up my crazy hair at the end of the day or on camping trips). Strider bike would be given to my cousin's little girl or my 4 year old would keep it if we could upgrade to the larger size... she is super sad to have our grown hers. And our favorite outdoor activity if you ask me would be cross country skiing, hubby wiuld say down hill skiing, and the kids would say snow ball fights and making snow men. I would love a new pair of Keen winter hikers (the Delta looks good) but they also have so many cute casual boots to wear when I'm not out exploring. It would be hard to chose! I'd love a pair of microspikes for urban dog walks (it can be so slippery with the chinooks) but also for tackling some winter hiking. I'm getting pretty excited for cross-country skiing - I just bought new skis and can't wait to get out on them. I would like a pair of light hikers. Micro spikes would be great for some shoulder season scrambles and I love watching munchkin toddler through the snow. Awesome list, thanks for the great ideas...see you on the trails! Keens waterproof light hikers for hubby. Microspikes for the kids (we picked up some last year for us and now feel so much more confident and ready to do more winter hikes). Strider...all over! but first trip probably to Troll Falls. I've been eying other people's Buffs...I think that's this year's stocking gift for everyone. Great list Tanya! Great guide and info. Especially for non winter types like me. I would like to get a pair of Keen sandals. I would actually take it to our local trail down by the river. I would take the Strider Ski Bike to Selkirk National Park!!! What is our favourite thing to do in the snow as a family? That's tough, too! We enjoy snowshoeing and skiing. We just recently got into mountain biking though, and I have a feeling fat bikes might be our new favourite pretty soon! Awesome list of gifts! I'd love to win some Keen's!! We love to build snowmen! I would like some snow boots. I would use the Kahtoola Micro Spikes to try some ice climbing this winter! Looks amazing! Ive never used a Buff head wrap before. If I won one, I would use it out on my winter adventures snowshoeing and snowboading! I would like to buy some warm boots for myself for the winter. I would like to get the BERN BABY BERN BOOT. From Keen Footwear I would order the REISEN LACE in The Dress Blue. I would give the strider bike to my son to use to go to work. I'd love to get a pair of boots from Keen. Either a nice pair of winter boots or perhaps even work boots since i go through at least two pairs a year. I really like TYRETREAD ZIP WP! I'd love to pick up a pair of hiking boots with the card! I would love a pair of Keen Kate Mid boots. I would love to win a Strider bike for my toddler. She would love it! We would take it to the sledding hill, for wintery walks with the dog and to the mountains when visiting grandparents. I would get new sandals for next year! My current pair of Keen sandals are quite worn (they are 3 year old). Thanks for the chance! I would love some new Keen sandals! I would take my strider ski bike to the local sledding hills! Id like to win a pair of work boots from keen. They have nice ones. I would like to say winter hiking is the only place I would use Kahtoola Micro Spikes however the icy streets of Calgary would not be out of the question. We would take the Strider Sport Balance Bike from Run Bikes YYC to school everyday! I would love to win a pair of hiking shoes/boots from Keen Canada. I would take the Strider Ski Bike to the nearest snow trails!! It would be great to win a copy of the book "Sliding in the Snow." What is your favourite thing to do in the snow as a family? I like to go sliding. It would be great to win one free pair of shoes from KEEN Canada. What would you like to buy with your "free shoe" card? Keen makes so many cool boots I would love to get a taller pair since I have ankle high ones now! I live on Prince Edward Island and it is surprisingly hilly so we'd head out to the country and try it out! 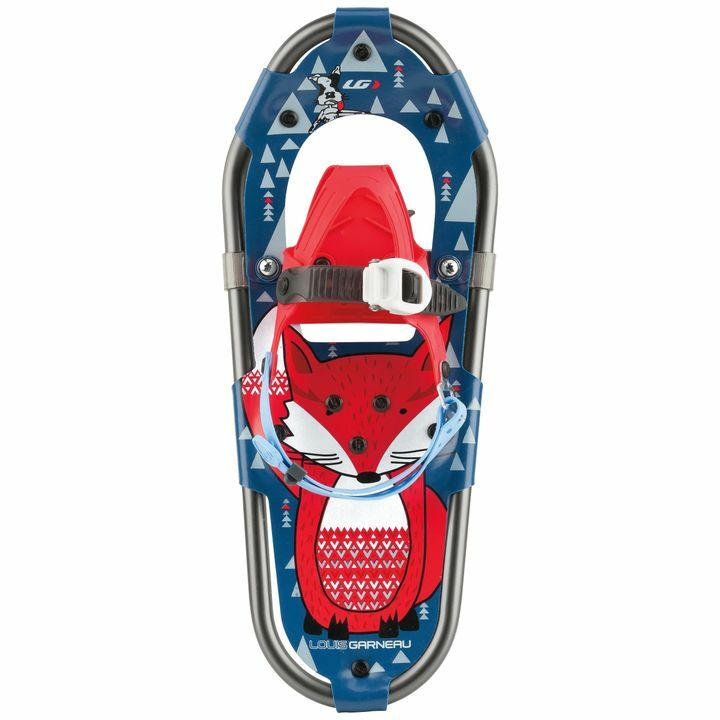 I have been eyeing a pair of Keen winter boots since last winter and have been contemplating trying snowshoeing for the first time too. The Kahtoola microspikes would be handy for my 3 year old as he is clumsy on slippery snow/ice (not surprising). We would take the Strider downtown to the park! I would love to get a pair of warm winter boots. I love the Elsa boots!